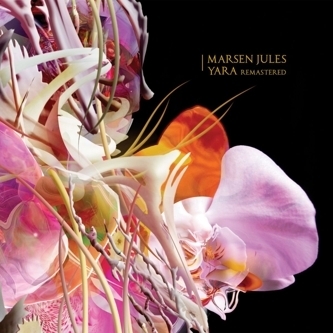 Originally released in 2004, Marsen Jules' outstanding slice of contemporary ambient music, Yara, has been remastered and reissued by the Oktaf label, complete with a further two bonus tracks that add nearly twenty-minutes of new music. As established fans of this artist's work will already know, Jules (real name Martin Juhls) has forged a creative path through dissecting classical music and reshaping it in a Steve Reich-inspired, looping, minimalist fashion. Much of what Juhls went on to achieve with his City Centre Offices releases, Herbstlaub and Les Fleurs was pioneered on two early digital-only albums for Autoplate, Lazy Sunday Funerals (2003) and Yara (2004), both of which have now been re-released in a remastered form with brand new artwork. All the original acoustic recordings used for this album come from the classical trio, Yara, with harp performances by Meike Rath, and despite being heavily manipulated and sliced into loop-shaped fragments, there's a very in-the-room live feel to this record. This manifests itself prominently on the bonus cut 'Harfenklang' through the intimacy of the piece's short, reflective reverb - lending a sense of perspective on the harp sounds - but over the course of the main album, Juhls' focus seems to slowly disintegrate and disperse into the auditorium: from 'Yara 4' through to 'Yara 6' you'll hear the strings, piano and harp starting to vapourise. This ethereal tone is reprised on the closing fifteen-minute 'Yara Variation', which layers the ambience of the performance venue with recordings of crowds and percussive, bell-like sounds. On this piece the string instruments arc and soar from the low-level babble of the space, bringing a miasmic, fluid quality to the composition that obscures the joins in the loops. The faded, slightly distant beauty of Yara has endured well over the six years since its first release and this new presentation of the album is easy to recommend, both to fans old and new.